Scores of global elites including Prince William, Duke of Cambridge, British broadcasting icon and naturalist Sir David Attenborough, Japan’s prime minister Shinzo Abe, Germany’s chancellor Angela Merkel, New Zealand’s prime minister Jacinda Ardern, Israel’s prime minister Benjamin Netanyahu, and Brazil’s new prime minister Jair Bolsonaro have descended on the Swiss Alpine town of Davos, Switzerland for the 2019 World Ecomomic Forum Annual Meeting. The conference officially opened today, and will end on Friday, Jan. 25. They’re among the roughly 3,000 participants hailing from all over the world, top figures in the fields of business, government, media, academia, arts and culture. Despite the partial government shut down, U.S. government officials are also among the attendees. They include U.S. Secretary of State Mike Pompeo, who spoke earlier this morning. And of course, the business TV networks are sending their top talent to cover Davos 2019. Tom Keene, Francine Lacqua and Jonathan Ferro will host Bloomberg Surveillance from Davos, Tuesday-Friday from 4 – 9 a.m. ET. Bloomberg will expand its programming reach by simulcasting the 7-9 a.m. ET block on radio. 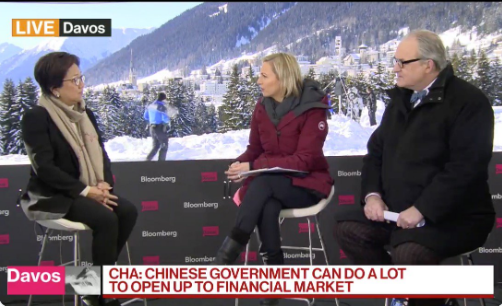 Bloomberg Markets: Asia host Haslinda Amin will also join the crew in Davos to capture content for the Asia markets. Erik Schatzker will conduct key newsmaker interviews. Bloomberg TV will also add in a highlight hour from 10-11 a.m. ET. The hour will recap the biggest headlines of the day, and include additional live interviews with global newsmakers, business leaders and policy makers. TicToc by Bloomberg (@TicToc) will be on location to offer comprehensive coverage and real-time updates all week. TicToc’s Kurumi Mori and Charlie Lait will explore all the hideaways, personal stories from attendees and insights from behind-the-scenes. TicToc will livestream Bloomberg’s panel discussion on Wednesday about the state of the world’s ocean, and will take questions on Twitter to put to Al Gore and other global leaders. Bloomberg will host its The Year Ahead Davos event on Tuesday, Jan. 22. The event will provide delegates with necessary insight to better plan and prioritize for the trends, issues and challenges that they will face in 2019. At the event, Bloomberg Editor in Chief John Micklethwait will interview Citigroup CEO Michael Corbat on the outlook for the banking and financial sector in 2019. Bloomberg Television anchor Francine Lacqua will speak with Matt Damon and Gary White, CEOs and Co-Founders of Water.org and Water Equity. Stephanie Flanders, Bloomberg Senior Executive Editor for Economics, will lead a discussion on the importance of representation from Wall Street to Main Street with Bank of America Vice Chairman Anne Finucane, Bloomberg Chairman Peter Grauer, and Dina Powell, Managing Director, Goldman Sachs. Flanders will also interview F1 2016 World Champion and green tech investor Nico Rosberg on driving returns with impact technology. Other participants include Willis Towers Watson’s Julie Gebauer and P & G Chief Brand Officer Marc Pritchard. On Wednesday, Jan. 23, Bloomberg hosts The Smart Economy event, convening c-suite leaders for a program focused on what business can do to capitalize on the next wave of innovation in order to build a better, more sustainable global economy. Bloomberg’s Brad Stone and Jackie Simmons will moderate sessions featuring speakers including: Börje Ekholm, Ericsson President & CEO; Peggy Johnson, Executive Vice President, Business Development, Microsoft; Urs Schaeppi, CEO, Swisscom; Christiana Figueres, Convener, Mission 2020; Suzanna DiBianca, EVP of Corporate Relations & Chief Philanthropy Officer, Salesforce; Peggy Johnson, EVP of Business Development, Microsoft; and Johan Rockström of Potsdam Institute for Climate Impact Research and Stockholm Resilience Centre. Squawk Box is live from Davos with Becky Quick, Joe Kernen and Andrew Ross Sorkin. Sara Eisen will also be live for Squawk on the Street. Hugh Son and Brian Schwartz will be covering Davos for CNBC Digital. Some of the guests today include: Marc Benioff, Chairman & CEO, Salesforce.com, Brian Moynihan, CEO, Bank of America, Steve Schwarzman, Chairman & CEO & co-founder, Blackstone Group, Arne Sorenson, CEO & President, Mariott International, David Abney, CEO & Chairman, UPS, Scott Minerd, Global CIO & Chairman of Investments, Guggenheim Partners LLC, Ray Dalio, Founder & President & CIO, Bridgewater Associates, Ginni Rometty, Chairman & CEO, IBM, Bob Dudley, CEO, BP and Glenn Hutchins, Chairman, North Island. The official theme of this year’s conference will be Globalization 4.0: Shaping a Global Architecture in the Age of the Fourth Industrial Revolution – calling for renewed commitment to international collaboration. CNN’s live coverage begins on Monday, January 21st and runs throughout the week. Richard Quest will anchor The Express & Quest Means Business. Julia Chatterley will anchor First Move and Becky Anderson will anchor Connect The World. Global markets editor Maria Bartiromo will present Mornings with Maria live from Davos, Switzerland on Tuesday, Jan. 22 from 6 – 9 a.m. ET. Bartiromo will be anchoring from the World Economic Forum, which brings together the world’s most powerful political leaders, investors, CEO’s, and business titans to debate and collaborate on long-term global economic trends. On Tuesday, FBN will present special early morning coverage of the forum with an extended edition of FBN:AM beginning at approximately 3:45 a.m. ET. In the live coverage, FBN will air the forum’s opening session where Bartiromo will moderate a panel of notable voices in the global economy including Bridgewater Associates Founder Ray Dalio, Goldman Sachs CEO David Solomon, and China Securities Regulatory Commission Fang Xinghai, among others. Throughout the duration of Bartiromo’s live coverage from Davos, she will also present interviews with other leaders in the global economy including IBM CEO Ginni Rometty, UPS CEO David Abney, Blackstone CEO Stephen Schwarzman, Verizon CEO Hans Vestberg, Coca-Cola CEO James Quincey, NASDAQ President Adena Friedman, Hewlett Packard Enterprise CEO Antonio Neri, Microsoft President Brad Smith, and more. Beginning on Tuesday, MSNBC’s Stephanie Ruhle and Ali Velshi will deliver live coverage throughout the week from Davos. Starting at 8 a.m. E.T. on Tuesday, Yahoo Finance editor-in-chief Andy Serwer will host a special hour of live daily programming from the World Economic Forum, featuring interviews with some of the biggest names in business, politics, academia, and more. Serwer will be joined on the ground throughout the week by Yahoo Finance Anchor Julie Hyman, Reporter Brian Cheung, and Senior Economics Correspondent Alanna Petroff, with additional live streamed panels, interviews and dispatches from Davos to air during Yahoo Finance’s regular 8 hours of bell-to-bell coverage from 9 a.m.-5 p.m. ET available on the web, mobile web, Yahoo Finance app, Apple TV, and via Yahoo on the Roku Channel. Among the guests confirmed to appear are: Christine LaGarde, Managing Director, IMF; Mark Weinberger, EY Global Chairman & CEO; Roger Crandall, MassMutual CEO; Hans Vestberg, Verizon CEO; Kasper Rorsted, Adidas CEO; Lynne Doughtie, KPMG CEO & Chair; Mary Erdoes, JPMorgan Asset Wealth Management CEO; Mark Haefele, UBS Global Chief Investment Officer; Bob Moritz, PwC Global Chairman; Gayle Smith, CEO of ONE; Vasant Narasimhan, Novartis CEO; Bea Perez, Coca-Cola Chief Sustainability Officer. Yahoo Finance will also air a special episode of “Influencers with Andy Serwer” featuring top interviews with newsmakers on the ground in Davos. Additionally, Jackie DeAngelis will anchor The Ticker at 2 p.m. ET for the first time.